Asthma has become the most prevalent chronic disease in children and the most frequent cause of hospitalisation in children under 15 years of age (Asher MI et al., 2006). Between 1999 and 2004, the number of children suffering from asthma in individual European countries varied from less than 5% to more than 20%. Since sensitisation to allergens in people is on the increase, more allergies can be expected in Europeans in the future (Asthma, 2006). Recent studies have validated the relationship between air pollution due to particulate matter PM10 and the development of asthma in children (McConnell et al., 2006). 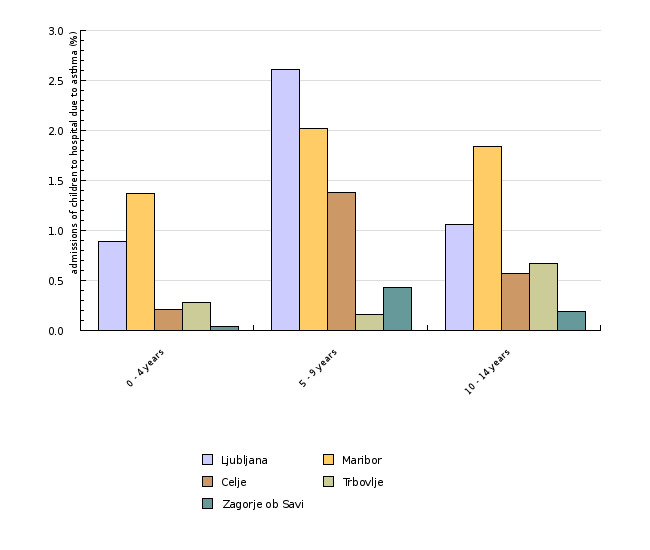 The indicator shows the proportion of admissions to hospital of children due to asthma for various age groups (0–4 years, 5–9 years and 10–14 years). 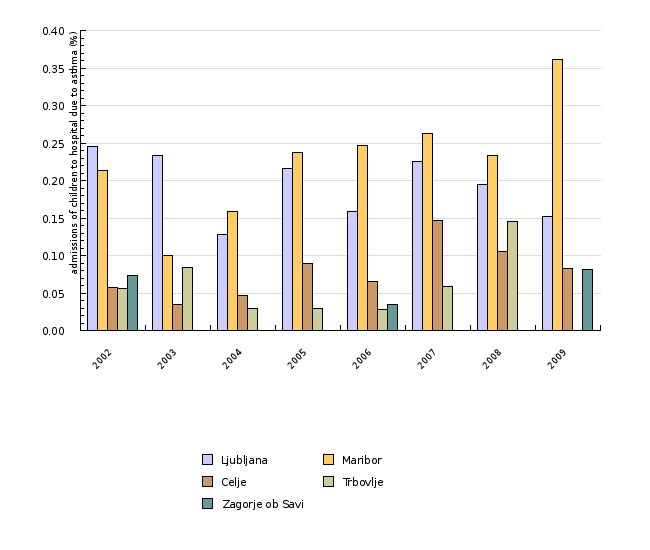 The data cover the period from 2002 to 2007 and the towns of Ljubljana, Maribor, Celje, Trbovlje and Zagorje ob Savi. For the purpose of comparison with the EU, the indicator contains the data on the prevalence of asthma, allergic inflammation of the mucous membrane of the nose and conjunctivitis in selected EU countries. In Slovenia, there are no data on the number of children with asthma and allergic disorders. A rough estimate was elaborated using data from neighbouring Austria, where relevant records are maintained. It is presumed that the values in Slovenia are very similar. Asthma is a chronic inflammatory disorder produced by allergies, viral infection of the respiratory system or airborne irritants. It causes occasional and temporary narrowing of the respiratory tract, which is manifested in difficult breathing, wheezing in the lungs and coughing (Otorepec et al., 2008). The symptoms of allergic inflammation of the mucous membrane of the nose and of conjunctivitis are sneezing, blocked nose and itching nose, eyes or throat. The development of asthma and allergic disorders in children is a consequence of the complex interaction of the environment, genetic factors and the immune system (Marshall, 2004; ISAAC Steering Committee, 1998). Asthma is a significant childhood illness and the major cause of hospitalisation of children less than 15 years of age (Otorepec et al., 2008). McConnell R, Berhane K, Yao L et al. Traffic, susceptibility and childhood asthma. Environ. Health Perspect. 2006 May; 114(5):766-72. Measures to reduce the number of children with asthma and allergic disorders must target two levels: the first to prevent the exposure of children to risk factors that may cause the development of asthma and allergic disorders, and the second to remove risk factors that may exacerbate existing illnesses (asthma and allergic disorders). Because of a number of risk factors causing asthma and allergic disorders, the environmental field can indeed address this issue chiefly by reducing the level of particulate matter, ozone and nitrogen dioxides air pollution since these pollutants can exacerbate the underlying disease. The number of patients suffering from allergic disorders and asthma is on the increase in Europe. According to data from the World Health Organization, approximately 20% of the world population suffers from allergic disorders. In cities and in particular in city centers with the highest levels of air pollution, the number of children suffering from asthma is on the increase. The latest studies show a relationship between exposure to polluted air and exacerbation of asthma, chiefly due to exposure to dust particles and ozone. Physical activity, too, increases the risk of respiratory problems on days with the highest concentration levels of ozone. Long-term simultaneous exposure to ozone and allergens causes permanent respiratory problems. The development of asthma and allergic disorders in children involves a complex interaction between the environment, genetic factors and the immune system (WHO, 2006; Green, 2003). Children living in spaces largely exposed to dampness, mould, mites, house pets and tobacco smoke from their parents are more likely to develop asthma. Properly treated, asthma patients or patients suffering from allergic disorders can control their illness and live normal lives. In order to prevent the exacerbation of asthma and allergic disorders, it is imperative that preventive measures be taken to decrease exposure to the most frequent risk factors, such as tobacco smoke (Otorepec et al., 2008). As a rule, exposure to allergens increases hypersensitivity to asthma. The major allergen in occupied spaces is house-dust mites. Mites are most frequently found in the textile parts of furnishings. Their development is significantly influenced by the level of relative humidity – which must be higher than 50% – and the presence of carpets, woollen materials and similar furnishings in occupied spaces. Exposure to high concentration levels of mites indoors doubles the probability of developing hypersensitivity in children, which eventually leads to asthma. Mites cause the aggravation of asthma in children with asthma who are hypersensitive to mites (Environmental Protection Agency, 2005). Major allergens, in addition to mites, are moulds and pet secretions. Mites are found chiefly in damp and poorly ventilated rooms, and pet secretions in dwellings where pets are kept. Dampness causes the growth of spores and, consequently, moulds. Moulds irritate the respiratory tract and cause inflammations and hypersensitivity, which can trigger asthma or its aggravation. The World Health Organization has concluded that, in children, moulds trigger coughing, wheezing in the lungs and asthma. Children living in damp dwellings face a higher risk of developing asthma – 1.5 to 2.2 times higher than children living in a suitable housing environment (Otorepec et al., 2008). In Austria, the proportion of children with allergic inflammation of the mucous membrane of the nose and with conjunctivitis was 7% in children aged between 6 and 7 years, and 15% in children aged between 13 and 14 years, in the period 1999–2004. In Austria, the proportion of children with asthma was 6% in children aged between 6 and 7 years, and a little less than 10% in children aged between 13 and 14, in the period 1999–2004. It is believed that similar figures apply to Slovenia (ENHIS - European Environment and Health Information System, 2007). The United Kingdom had the highest proportion of children with asthma: more than 20% in children aged between 6 and 7 years, and more than 25% in children aged between 13 and 14 years. Albania had the lowest number of patients with asthma in both age groups in the same period (<5%). The difference between countries may be attributable to differing lifestyles, dietary habits, socioeconomic differences and environmental or climatic factors. Awareness of the illness can also have an impact on the number of patients (ENHIS - European Environment and Health Information System, 2007). In recent years, the number of children with asthma has increased in Europe by approximately 0.5% a year, and approximately 1% in Austria. 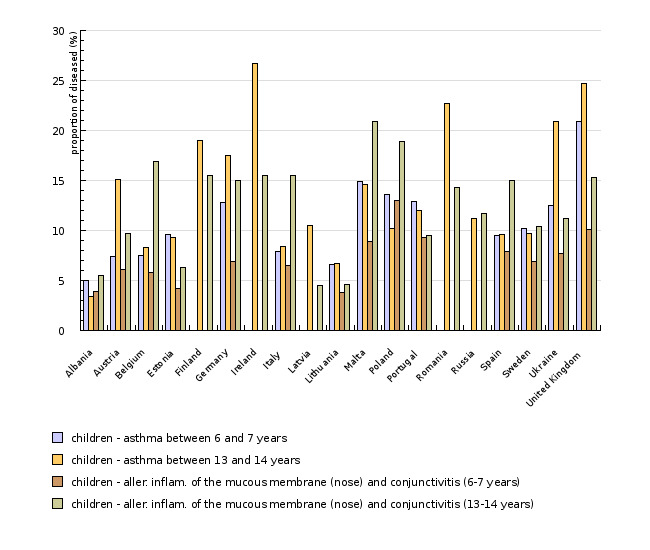 Data on those suffering from asthma and allergic inflammation of the mucous membrane of the nose and from conjunctivitis in selected countries of Europe for the period 1999–2004 are shown in ZD2-3. In Slovenia, there are no data available on the number of children with asthma; available, however, there are data on the number of admissions to hospital due to asthma and other respiratory diseases, as shown in Figures ZD2-1 and ZD2-2. Figure ZD2-1 shows that Ljubljana and Maribor had the highest level of children suffering from asthma, which is an additional indicator of higher levels of air pollution leading to a greater number of children developing asthma. The number of patients has increased over the years. 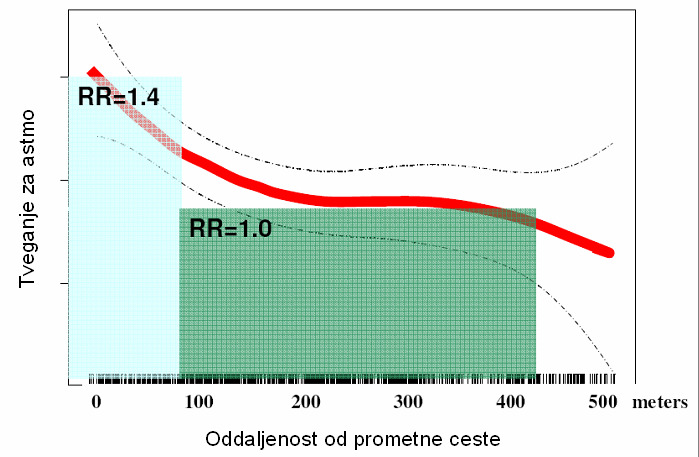 Figure ZD2-2 shows the proportion of admissions to hospital due to asthma in 2006; it was 0.9% in children aged between 0 and 4 years, 2% in children aged between 5 and 9 years and 1.2% in children aged between 10 and 14 years (Institute of Public Health of the Republic of Slovenia, 2009). The number of admissions due to asthma is low, which does not mean that there are few asthma patients in Slovenia; it does show, however, that in Slovenia children with asthma are well taken care of on an outpatient basis – they receive adequate therapy, which prevents the aggravation of asthma leading to hospitalization. The most recent data show that particulate matter PM10 found in outdoor air not only aggravates asthma but also triggers the development of asthma in children. The risk of developing asthma depends on the concentration of PM10 in outdoor air and on the distance between homes and busy roads, as shown in Figure ZD2-4. Traffic is indeed the main source of PM10 pollution. Children living 50 m from a busy road face an approximately 50% greater risk than those living more than 100 m from busy roads (McConnell et al., 2006). Source database or source: Official data were used for the calculation of the number of admissions to hospital due to asthma, as incorporated in the database of the Institute of Public Health of the Republic of Slovenia. Methodology and frequency of data collection for the indicator: The data cover the period 2002–2007 and are collected on an annual basis. Data processing methodology: For transparency purposes, the data on the number of admissions to hospital due to asthma are presented as proportions. Data were taken from the international study on asthma and allergies in children (ISAAC), which covers children with asthma symptoms and symptoms of allergic inflammation of the mucous membrane of the nose and conjunctivitis in age groups 6 to 7 years and 13 to 14 years. Some 66 centres in 37 countries were included in the research in respect of children aged between 6 and 7 years, and 106 centres in 56 countries in respect of those aged between 13 and 14 years. Data processing methodology: Proportion of children with asthma and allergic inflammation of the mucous membrane of the nose and with conjunctivitis in the total number of children in the age group under consideration. - Asher MI et al. Worldwide time trends in the prevalence of symptoms of asthma, allergic rhinoconjunctivitis, and eczema in childhood: ISAAC Phase One and Three repeat multicountry cross-sectional surveys. Lancet, 2006, 368:733-743. - Asthma. Geneva: World Health Organization, 2006. Fact sheet No. 307. (7 March 2007). - Effects of air pollution on children`s health and development- a review of the evidence. WHO European Centre for Environment and Health. Copenhagen, WHO Regional Office for Europe, 2005. Accessed 6 March 2007. - ENHIS, 2007. Prevalence of asthma and allergies in children. World Health Organization, Europe. - Green RJ. Inflammatory airway disease. Current Allergy and Clinical Immunology, 2003, 16:181. - ISAAC Steering Committee. Worldwide variation in prevalence of symptoms of asthma, allergic rhinoconjunctivitis and atopic eczema: ISAAC. Lancet, 1998, 351:1225-1232. - Marshall GD. Internal and external environmental influences in allergic diseases. Journal of the American Osteophatic Association, 2004, 104(Suppl 5):S1-6. - McConnell R, Berhane K, Yao L et al. Traffic, susceptibility and childhood asthma. Environ Health Perspect. 2006 May; 114(5):766-72. - National survey on Environmental Management of Asthma and Children`s Exposure to Environmental Tobacco Smoke. Fact Sheet. Washington, DC, United States: Environmental Protection Agency, 2005. (7 March 2007. - Otorepec P, Horvat M, Hojs A in sod. Akcijski načrt za okolje in zdravje otrok, Ministrstvo za zdravje. Ljubljana, januar 2008.